Centenary's Meadows Museum of Art will host two local student art exhibitions from May 4 through May 18. The Museum's first floor will be devoted to the work of more than 100 students from the Caddo Parish Talented Arts Program. The entire second floor will feature hundreds of artworks from Caddo Parish Magnet High School. The opening reception for all the student artists will take place Sun, May 4, from 1-3 p.m. Both exhibitions and the reception are free and open to the public. The Highland neighborhood art sale is back on Sun, May 4, 11 am until 4 pm, says Liz Swaine. Get a map of the tour at 436 Topeka St.
• 436 Topeka - paintings, jewelry and the works of Su Stella, iron work by Curt Harville. • 226 Columbia Street - the Pop Art-inspired paintings of E.d. Stewart. • 1173 Louisiana - Blue Southern Comfort Food- great food, burgers to write home about, art and occasionally, music! Bring your dog, sit in the new dog-friendly fenced patio. • 424 Dalzell - the Louisiana-themed art of Karen LaBeau, cards & prints by Marci Gatlin-Hicks (Great for Mother’s Day! ), artist Debbie Leggett. Paint a pot for spring! • 2911 Centenary Boulevard - Meadows Museum of Art. See details at La Tech U admissions. River City Rep debuts a new production of the Tony Award nominated comedy Venus in Fur, says Patric McWilliams. Charity Schubert has returned from NYC to take the role of Vanda. Logan Sledge plays Thomas, the director. When an actress arrives several hours late to an audition, the director is less than impressed. But Vanda's masterful performance flips the script on Thomas' expectations and turns the session into a tango for dominance between actress and director, woman and man. Samantha Normand has been designing and sewing her own clothing since childhood. Last summer the 17 year-old Caddo Magnet HS attended fashion sessions at Chicago Art Institute. She recently presented clothing in a group exhibit at Multi Cultural Center for the South. Normand is known for innovative designs and for re-cycling. "Her emphasis in her own designs is towards the individual expression more than practical garb," says Brian Landry, Jr. In the cast: Jan Adams, Lewis Elder, Ginger Folmer, Cara Johnston, Brad Kozak, Debbie Posey, Joe Todaro and Virginia Walker. April 24, 25, 26, May 1, 2, 3, 2014 at 8 p.m. and April 27, May 4, 2014 at 2 p.m. at SLT, 812 Margaret Place. Tickets: $17 / 15: 424-4439. 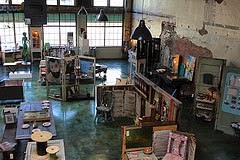 Juried Roster Artists Meeting: Mon, Ap 28, 5:30 pm at Central Artstation, 801 Crockett St, downtown Shreveport. Special Guests: Airlift. Delaney Martin, Taylor Lee Shepherd and Frank Pahl will speak about their musical house debut at May's UnScene. When Shreveport dance star Calvin Alexander jumps, rolls and lands upon the stage, audience members can be forgiven if they gasp with pleasure. For Calvin is age nine. Yet he has world-class dance moves. In fact, he has already spent a year on the road in a touring company of Broadway musical Billy Elliott. He has played the role of the youngest version of Billy, aka Billy Small. Says Kathryn Alexander, his mother, "He started taking dance at Carol Anglin Dancenter when he was three years old. This includes ballet, tap, jazz and modern. He has been doing this ever since except for the fourteen months he was on tour with Billy Elliot (350 shows). He did not have a dancing role, but but participated in the ballet warm up before each show and had occasional tap and ballet classes with some of the adult cast members." The son of physician Calvin D Alexander and former nurse Kathryn Alexander, Calvin is preparing himself in a balanced way. Kathryn says, "Cal has also been taking violin through the Centenary Suzuki School for the past five years and tumbling and trampoline through Jill's Gymnastics for five years as well. For the past six months, he has been taking voice/acting lessons from Ron Bermingham at Centenary." Says teacher Carol Anglin, "Cal approaches every class and rehearsal as though it is the most important performance of his life. Not only is he an exceptional dancer, but Cal is intelligent, musical, focused, driven, athletic, a team player, and steps up to the plate with each and every challenge. I can’t wait to see what the future holds for this outstanding young man." As a member of the junior company of Louisiana Dance Theater he will be onstage Saturday, April 26, at Dance His High Praise at the Strand Theatre in Shreveport. 7:00 pm. Tickets: Strand Box Office, 318.226.8555. Arts-minded retail center, The Agora Borealis, will replace defunct Lake Street Dance Hall at 421 Lake St.
At the historic and charming 421 Lake St site of the former Lake Street Dance Hall an enthusiastic young building owner named Katy Larsen is gutting and re-doing the space. It will be an arts-minded retail destination called The Agora Borealis. "The Agora Borealis would like to invite artists to send pictures of their work they would like to submit for admission into our store," writes Larsen. "We have about 3,000 sq. feet of retail space that we hope to fill with all kinds of goods, ranging from furniture, jewelry, decor, lighting, paintings, sculpture and other items. The set up will reflect natural indoor and outdoor settings and will blend all of our artists' products together." "Not everyone will make the first round of submissions for our grand opening - which may be in May - but please be patient because there will be much change over throughout the seasons. Each contract will be discussed with each artist and signed by both parties before opening. If you are interested or have any other questions or concerns, please contact me at theAgoraBorealis@gmail.com or by phone @318.243.1469." Photo Katy Larsen. Dianne Maroney-Grigsby directs the Orchesis Dance Company, Grambling University, and Carol Anglin directs the Louisiana Dance Theater in a production called Dance His High Praise at the Strand Theater on Sat, Ap 26. 7 pm. Joining them will be Christian Dance Theater and Sumthin Serious Hip Hop. Yoga Nidra class Mondays, 6 - 7 p.m. at the Lotus Studio 446 Olive Street, Shreveport, is one of numerous classes offered in the cozy Highland Shop. Belly dance, hatha yoga and hooping are also part of the weekly regimen at Lotus. No Yoga experience is required for Nidra Yoga, says instructor Joy Yeager-Lasher. "Already have a workout regimen in place? This class is a great addition to your routine to help strengthen the mind, which often gets neglected," says Joy. "Yoga Nidra is also known as “Yogic Sleep.” It is a sleep like state that yogis report during meditation. In this practice you will enter the deepest possible state of relaxation while still maintaining full consciousness. You will follow the voice of the Nararator who will guide you through breathing, body part focus, and visualizations. Yoga nidra provides full relaxation of the nervous system; builds a healthy and strong mind; improved learning and concentration; restored emotional balance; relief from insomnia, PTSD, OCD, anxiety, depression, and everyday stress." Class is $12 drop in or 4 classes for $40 in advance. Cash or check only, please. Robinson Film Center will host Louisiana Tech University physics professor Dr. Lee Sawyer at a screening of the new documentary “Particle Fever” at 5 pm, Sat, April 19 at RFC, says Alex Kent. Sawyer will introduce the film and follow with a Q&A. Imagine a documentary that captured the moment Thomas Edison turned on the film light bulb: the thrill of discovery, captured for the world to see. That’s what happens in “Particle Fever,” where audiences follow six scientists during the launch of the Large Hadron Collider. Not only does this giant machine represent the most expensive experiment in the history of the planet, but it helps 10,000 scientists from around the world ask one big question: by recreating the conditions that existed just moments after the Big Bang, can we explain the origin of all matter? If confirmed, does the Higgs boson (a.k.a. the God particle) help explain why we exist? Tickets, $7.50 ($5.50 for RFC members). Purchase tickets online or call the RFC box office at 318.459.4122. Run time: 99 mins. Particle Fever has been extended to May 1. While the 2014 Shreveport Farmer's Market opens May 31, the SFM FB page is alive with news of vendors. The page allows food source-minded people to follow regional changes and forge appropriate food connections. La Nouvelle-Orléans Mesdames (New Orleans Ladies), Creole artisan Karen La Beau and Creole culinary artist Panderina Soumas, will present "What Do You Get When You Cross a Gumbo Pot and a Paint Brush?," a unique art and food event, 1-4 p.m., Saturday, April 19 at The Naked Bean Cafe in Shreveport. The Naked Bean is located in the Highland Cultural District on 451 Kings Hwy. in Shreveport, Louisiana. Enjoy a great cup of coffee, tea, or a light bite from their menu. We have received your letter requesting to schedule a gathering of Artists to learn more about the selection process and upcoming opportunities for UnScene. We look forward to meeting with you on Wednesday, April 16 at 6:00 pm at the Central Artstation Engine Room. Please help to spread the word to all artists! From the Beatles and Rolling Stones to Muddy Waters and U2, smart teen Matthew Davidson gets it. His new 5-song release, "Cross My Heart," is danceable and effervescent. It's the kind of pop that will make you drive better and make you look good cutting a rug in your living room. Beginning as a kid with a hot hand for blues guitar, Davidson is transitioning to vocalist, songwriter and entertainer. Surrounded by rockin' tunes and effective harmonies, Davidson's package kicks. "Heartbreaker," his 4:16 master tune, is built on a snappy drum beat with a melody that builds inexorably to a feel good hook. In editing a videotape for his school, Caddo Magnet HS, Shreveport, I listened to "Heartbreaker" more times than you'd believe. It was rich. And remains my favorite cut. A huge parallel to John Mayer is there, but he must be listening to Herman and the Hermits and the Dave Clark Five, too. And the Young Rascals, for sure. Two songs on the EP were penned by Davidson, and three songs were co-written with Greg Walton. Musicians on the recording are: Matthew Davidson, guitars and vocals, Greg Walton, keyboard and vocals, Kyle McClanahan, drums, and Jimmy Wooten, bass guitar and drums. The EP was produced by Jimmy Wooten, engineered by Cody Lowery. It was mixed and mastered by Wooten and Lowery at The Pond Studios. Download his fresh five on iTunes and Amazon. Physical copies can be ordered online at www.matthewdavidson.net or purchased at live shows. Catch his sharp quartet Thurs, May 15, Spring Concert at Provenance Community, 6 to 8:30 pm, Sat., May 24, at Mudbug Madness, 4 to 6 pm, and Fri., May 30, at Free Fridays Forever under the Texas Street Bridge, 5 to 8 pm. By the Bog of Cats is a harrowing tale set on the Irish heath. Fri night at Centenary College a young troupe of actors brought the tragedy to the audience with aplomb. The restless heroine, Hester Swane, is bitter because her husband of 14 years has left her. In the everyone-knows-all world of an isolated Irish community, he is about to marry the respectable girl. Burying a black swan, conversing with ghosts, confronting the wedding party with her beauty and her tragic nature, actress Jordan Fell played the demented Hester with steady intensity. While the quality of her brogue made her difficult to understand at times, the key words and elements of her lament were continually clear. The tale includes a shamanistic figure called Catwoman, played by expressive actress Sandy Rather. On Friday night Rather's shining eyes and embracing smile were framed by an epic coat of cat furs. The boiling stage energy was intensified by the arrival of actress Heather Hooper, playing the unbalanced mother of Hester's husband. Hooper adeptly played the woman for both pathos and laughs. And on the topic of comic relief, it must be noted that another master actor, John Bogan, has the minor role of the dodgy priest. On Fri night Bogan's witty timing provided ample relief from the tale of catastrophes. Josie, the daughter of the heroine, was saucy, obeisant and sympathetic. She was brought to life with capable clarity by 14-year old actress London Todd. Her musicality, diction and appealing appearance tempt one to say a local star was being born on the MLP stage. Nathan Gauthier and Ashley Frisbee were convincing in their roles of the husband and new bride. Jonathan Slocum and Clint White were articulate in their characterizations of a ghost and the father of the bride. But the driving appeal of the Bog O Cats is in playwright Marina Carr's canny use of the myth of Medea as the ribs of her Irish tale. Highly recommended if you are weary of bread and circuses. Sat, Ap 12, at 8 pm and Sun, Ap 13, at 2 pm. Marjorie Lyons Playhouse. MLP box office (318) 869.5242. $15, 10, 5. Photos of the Fri performance. Please see earlier posts, too. Also, The Big Scene. "By the Bog of Cats" opens Thurs, Ap 10, and plays through Sun, Ap 13 at Marjorie Lyons Playhouse at Centenary College, Shreveport. All shows are at 8:00 except Sunday which is a 2:00 curtain. It is a contemporary and dark story from acclaimed Irish playwright Marina Carr. Centenary's guest director is from Pittsburgh and specializes in Irish drama; she is Melissa Hill Grande. Set by Don Hooper. "This is an emotional roller coaster ride for the audience," exclaims drama teacher Heather Peak Hooper. MLP box office (318) 869.5242. "This series was captured during a 221-mile solo hike across the Sierra Nevada mountain range in the state of California," artist Cody Cobb told thisispaper.com. "These photos attempt to communicate the psychological shift that occurs with the disappearance of sunlight while alone in the wilderness." Not everyone's cup of meat. But at age 29 Cobb is sounding a bit like Ansel Adams. Born and raised in Shreveport, he is more than an extreme hiker with a camera. His photo landscape photos have have, of late, been shown in Amsterdam (De Fotohal, 2013), NYC (Sundaram Tagore Gallery, 2014), Boston (Miller Yezerski Gallery, 2013), London (Mother London Gallery, 2012) and Moscow (Moscow Museum of Modern Art, 2012). He is being widely lauded as a first-rank lensman. His photos have been included in a dozen books during the past 2 years. Cobb described himself as "A photographer and motion designer originally from Louisiana. Sometimes I live in Seattle, other times in a 1995 Subaru station wagon or tent somewhere in the American West." As a teen he was into woods treks to see places like the abandoned Caddo Parish Penal Farm. "Growing up, I was mostly interested in abandoned buildings and urban exploration," he told Ligature.ch. "My options for this were limited after I moved to Seattle. I started spending more time outdoors and became comfortable spending days and eventually weeks at a time outside." Cobb was a 2002 grad of Caddo Magnet HS, where he was more into computers than art classes, says his dad, painter Don Cobb. Cody and his sister Alicia, a successful designer (Fossil Watches, Pier One Imports) living in Ft Worth, watched their dad at work in his sign shop as they grew up. Cobb, the dad, worked on the presses at The Times for 38 years but kept a sign shop on the side. Today he has a thriving business selling on Etsy and at fests like the Red River Revel. Cody went to the Academy of Art in San Francisco and did his first digital designing for Digital FX in Baton Rouge. After Katrina, he moved to Seattle to work as a motion designer with the top-drawer shop called Digital Kitchen. The projects he worked on included the Xbox 360 game Crackdown, the miniseries The Path to 911, the movie Superman Returns, and commercials for clients such as Yoplait and AT&T. "Today, he works for himself," says Don. "He'll work for Microsoft for a month, then take off hiking for a month." As a landscape photog, “I usually have a vague idea of the topography and a detailed understanding of my route and orientation, but the light and landscape is always unexpected. I shoot when I feel moved by that sense of discovery" the artist explains. His current favorite artists? ?He told globalyodel.com they are Henri Rousseau, Andrei Tarkovsky, Xeno & Oaklander. Tickets for White’s June 2 concert at the Municipal Auditorium will be available Friday, Ap 11, at 10 a.m. at the CenturyLink Center box office, all Ticketmaster outlets (and online at Ticketmaster.com) and via phone, (800) 745-3000, says The Times. $56 per ticket, fees included. General admission. "Caryn Jenkins will be our special guest at Monday night's A Better Shreveport meeting," says Loren Demerath. "She'll be updating us on ideas for the Cycle and Pedestrian Safety Campaign that she's begun to coordinate." Says Jenkins, "I spoke with Brian Parsons with the state DOTD Cycling and Pedestrian Commission, and then spoke with Dan Jatres with the Regional Planning Commission in New Orleans. I got some really great tips and info from these guys." "The campaign will be modeled on successful ones done elsewhere. It could be part of the overall trend in making our cities more bike-able and walk-able. Part of that is the way people are beginning to advocate for their right to bike and walk. Times are changing," notes Demerath. 6:00-7:00 pm, Monday evening at the Wright Math Building, 2907 Woodlawn Ave., two blocks up from the Gold Dome on Centenary's campus. See more at UnSceneShreveport.com and TheBigScene.org. Catch a vibe from snaps of the last Texas Ave Makers Fair. Yet the The Big Scene plans to double or treble what you see. La Dance Theater of Shreveport and Orchesis Dance Company of Grambling Univ perform at Emmett Hook Center, 550 Common St, Shreveport, on Ap 5 at 7:30 pm and Ap 6 at 3 pm, says Carol Anglin. Who is Theresa Andersson and why is she headlining The Big Scene, Texas Ave, Shreveport, on Sat, Ap 12? Better known in Sweden and New Orleans than in Shreveport, where she currently resides, Theresa Andersson is a singer-multi-instrumentalist at the highest order of musicality. Her voice is rich, whether in high or low register. She routinely and magically sings 3 or more parts of harmony with herself. Andersson uses loopers to multi-track her vocals as well as her drumming and guitar. To hear Andersson begin one of her songs with a hard-hitting drum beat is to know you're going to have a good time. When she adds violin and guitar to the mix the audience anticipation builds - I've been in her audience several times. And when she begins to add voices, this Swedish native makes smiles happen all across the crowd. As a song writer - her latest album is "Street Parade" and is nonpareil - she is both poppy and artful. Airing several of her Youtube videos for a group of teens recently I was impressed at how tuned in they became. Her husband, Arthur Mintz, is the creator of the puppet version of The Fantastic Mr Fox, a hit in both New Orleans and at Artspace Shreveport in 2011. It is clear from her videos that they enjoy working together and cross-cutting snazzy ideas and audacious constructions. There's no telling what to expect from Andersson on Sat, Ap 12, aside from smart pop that is danceable and mesmerizing. It is expected that she is unveiling a new show. In later April she will be performing in her adopted home of New Orleans and will play Jazzfest on May 2. She has well-known Shreveport accomplices in dance maven Luther Cox and troupe and gospel-mighty Sereca Robinson Henderson. Adding visual spectacle will be painter and animation mensch Joe Bluhm. Suffice to say that at 8 pm on Sat, Ap 12, I expect you to join me on Texas Ave for her show. Jason Vieaux, well-traveled guitarist, joins the SSO to present the Concierto de Aranjuez, followed by concertos by two of the most influential Latin composers of the early 20th century, Silvestre Revueltas and Manuel de Falla. Shreveport Symphony Orchestra, Jose Luis Castillo, conductor. Saturday, April 5 at 7:30 pm. Pre-show talk, shuttle parking, online tickets.